Hello everyone! 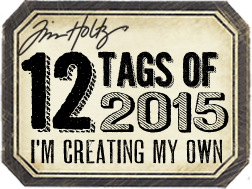 I'm here to show my take on Tim's June Tag for 12 Tags of 2015! His tag was so fun, didn't you think?!! And...so practical to be used to give gift cards...LOVE that! The man is so inspiring! So inspiring that I made three! 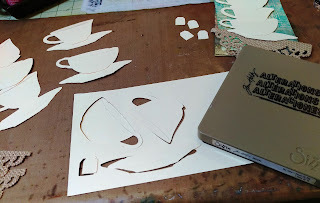 Since I've already used the Coffee Cup die on another project, I thought I'd go with the Tea Time die this time. The red is for me and the other two are gifts. I misted with both Antique Linen and Pumice Stone Distress Spray Stains from Ranger. So I cheated a lot. 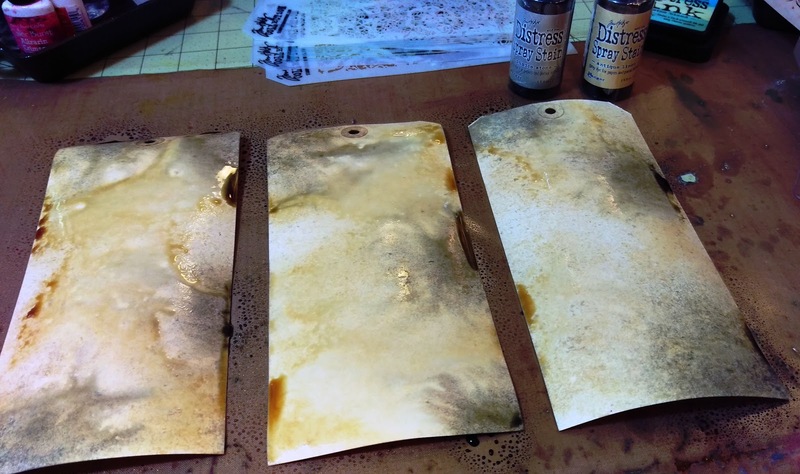 I only had one custom pad, so I just inked on the colors for the other two tags. Guess what's on my wish list now?!! I die cut the stick burlap from the Tattered Doily die, and the bottom of the tags as well. What a cool die! 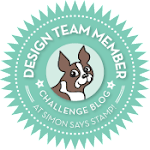 I used one of the pieces from inside the die on the tea bag tag...the little flower shape. Using trash is great!!! 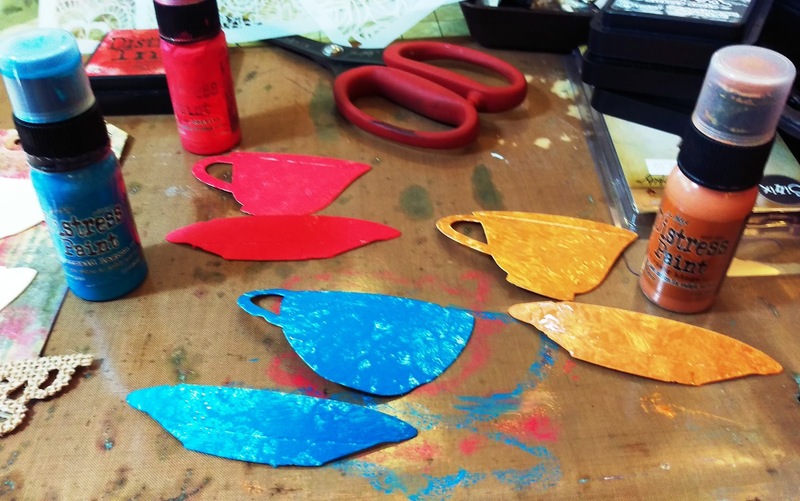 I die cut the tea cups with Manila. 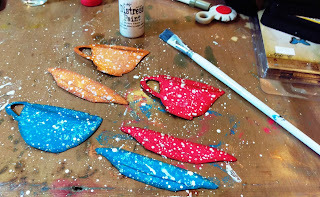 One of the cups and the saucers for each tag were painted with Distress, dried, and then inked. I also used a Frayed Burlap Marker to outline a little. 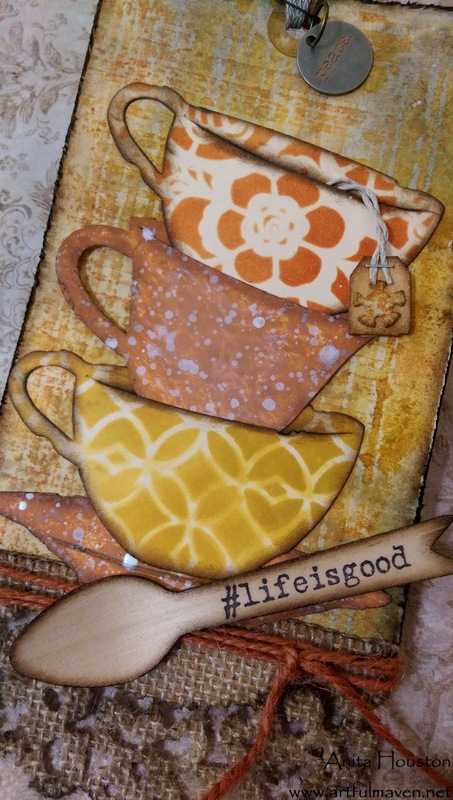 I wanted a granite ware look (Thanks Wendy Vecchi for the inspiration!) so I added drops of Picket Fence paint with a paintbrush. Messy goodness! 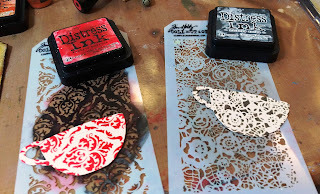 I stenciled in the rest of the tea cups with the Layered Stencils. It was hard to choose which ones to use. 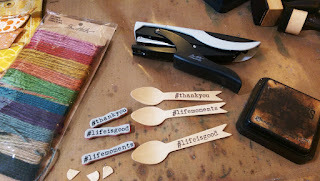 I fishtail cut the wooden spoons, inked them, and added the Hashtag sentiments. I stapled on string to the tea bag tags, and tied Jute Ribbon around each tag. 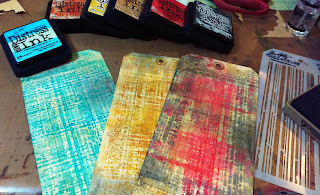 I also painted in the Typed Tokens for each tag. Thanks so much for looking and for all the comments! 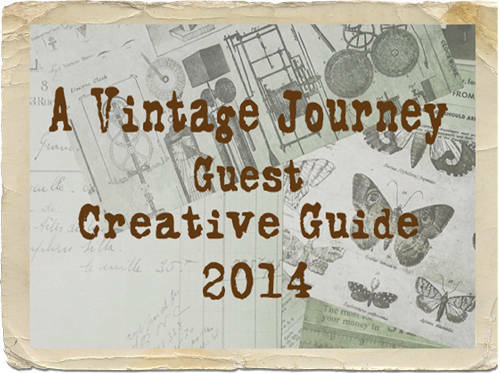 If you haven't gotten the chance to look at all the entries, I suggest you do. They are wonderful! These are so Cute!!! Ridiculously adorable!! So want one!! Inspired!!! 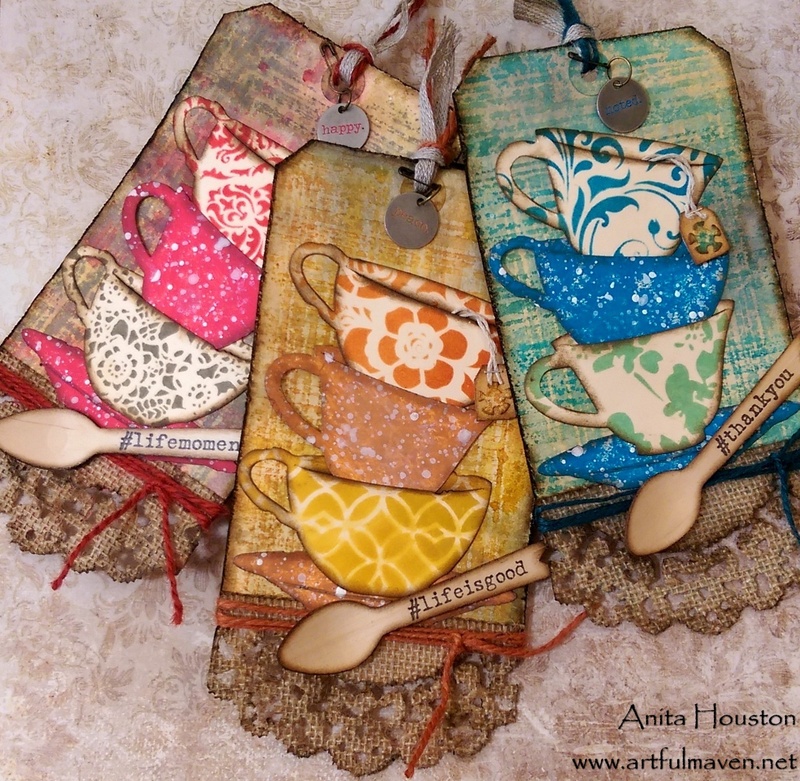 What a lot of fun you must have had making these tags Anita! 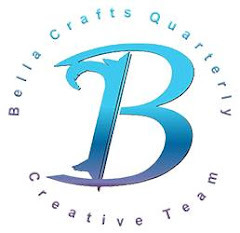 your creativity is beyond!! 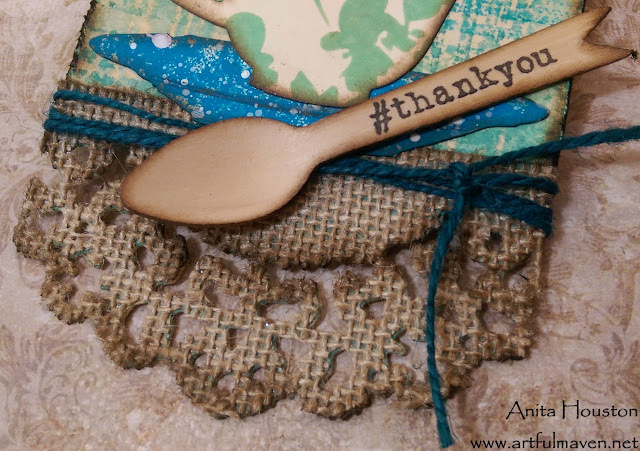 LOVE your backgrounds & the doily tag!! Wow, Anita,your tags are awesome. I just got this die and haven't played with it yet, but I love what you have done. 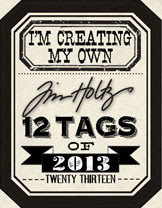 Great take on Tim's tag! Have a wonderful weekend! These are wonderful. Full of color and fun details. 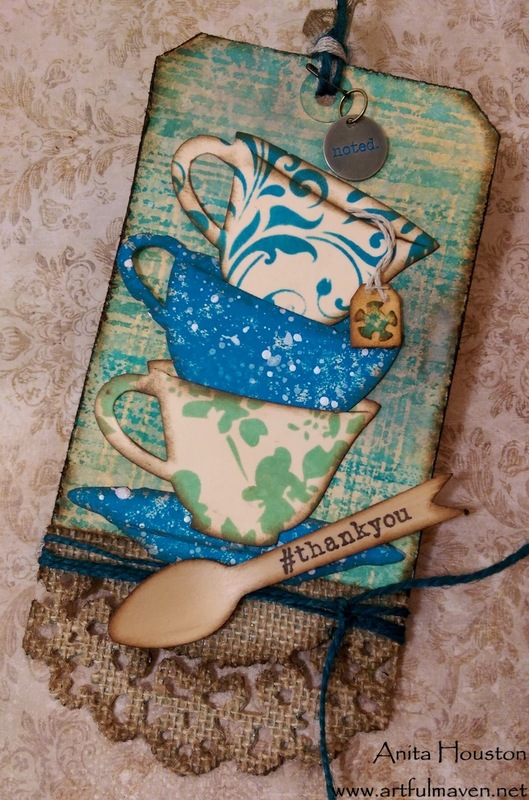 Love the burlap doily and the little flower tea bag tag. I absolutely love your original take on Tim's tag. The color and patterns you chose for the teacups are splendid. I have the doily die too, but wasn't happy with it when I used it. 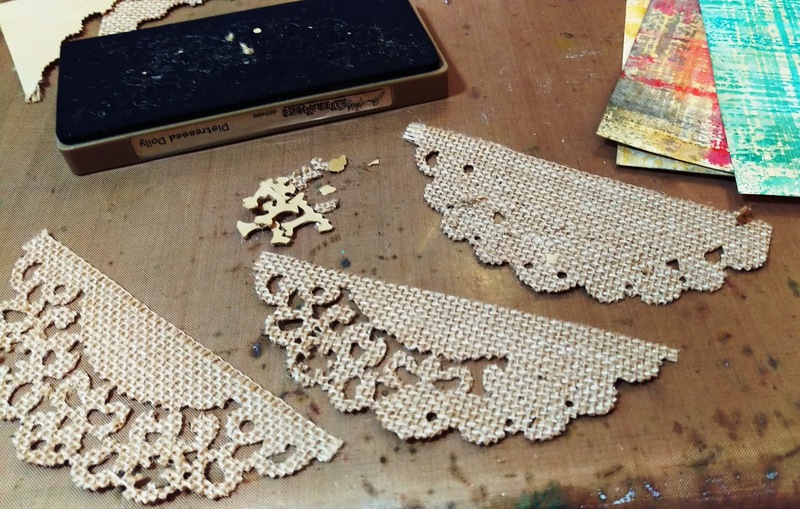 If I need multiple pieces of the same die and using cardstock, I usually cut 2-3 at a time. When I did this with the doily die, it ruined my paper because it got caught in the intricate design. I had to cut one piece of cardstock at a time. 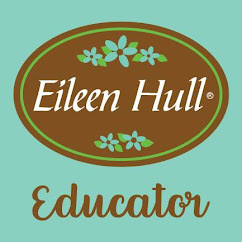 Did you have any problems cutting the burlap, which is much thicker than cardstock? Inspired indeed! The tea cups are so cute. The stenciling for the china pattern is brilliant! What great gifts. Thanks for sharing. These are super fun! Great job Anita. 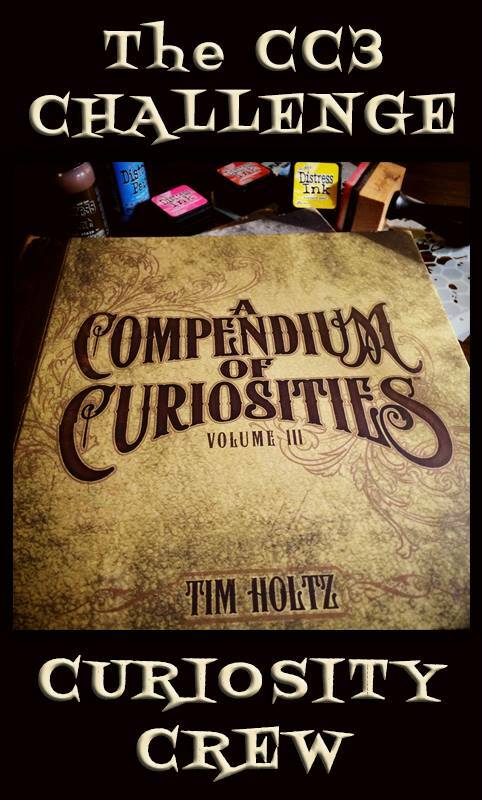 And I agree-Tim always comes up with some amazing things. 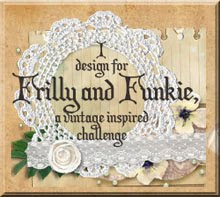 I love how the doily die makes an interesting bottom! 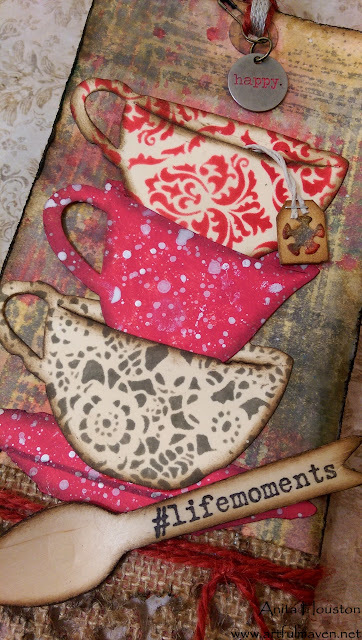 Perfect for tea cups. 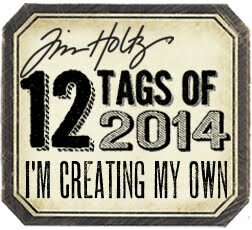 I love your tags Anita! Hmmm...I'm liking those teacups even more now. What a great design! 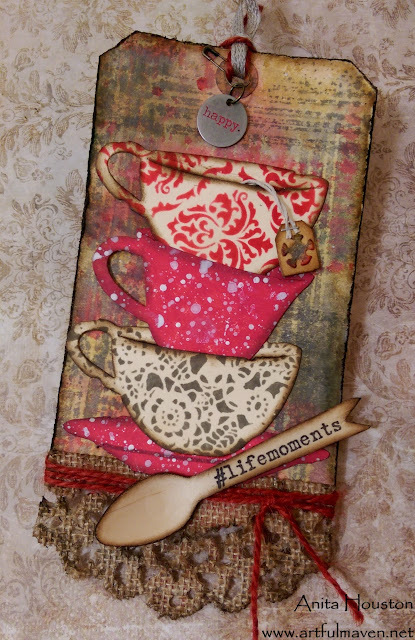 Love the burlap doily at the bottom and the beautiful tea cups. TFS Anita! great tags Anita - always the clever girl!! That little spoon at the bottom is darling! Beautiful tags! Gotta run now and die cut some Tim Tea Cups! Thanks for the inspiration. WOW...great inspiration and I really love what you did with these tea cups! 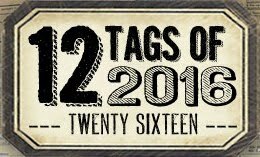 These tags are so amazing, and I love each one of them! Anita your tags are fabulous. Fantastic work. 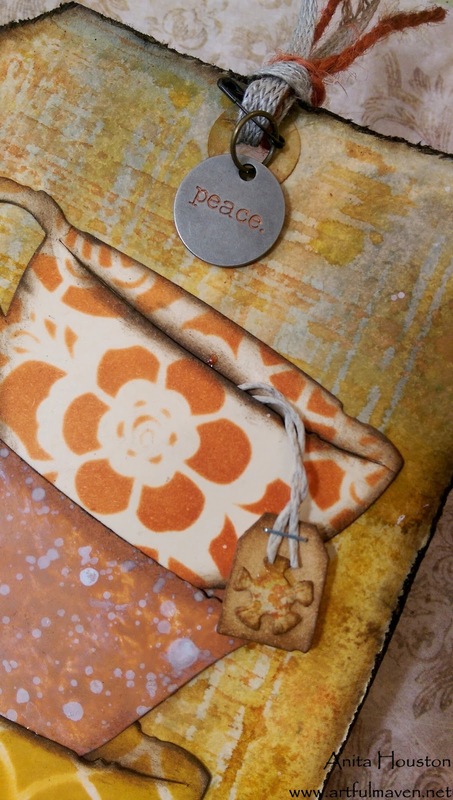 I love the idea you shared of using burlap cut with the doily die at the bottom of each tag. It looks so very decorative. Thank you very much for sharing your lovely project. These are just delightful, Anita - wonderful rainbow colours, impossible to choose which is my favourite of the trio. The patterned tea cups are so cute, and I love the lacy hessian bits at the bottom. They are so cute! I love the colours too. Oh my little goodness! 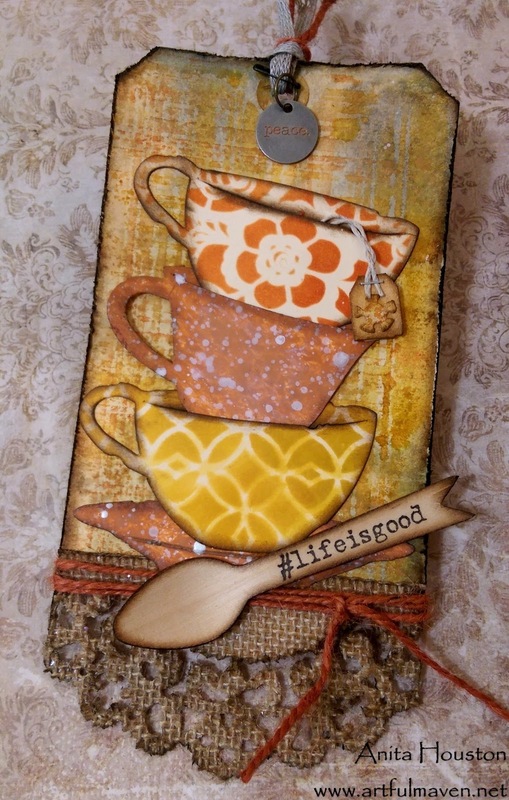 I am head over teakettle for these fabulous tags! I'm a tea drinker so these are right up my alley! I've been contemplating getting this die, and you just sold me! Honestly reading your blog is so bad for my budget! LOL I love the graniteware look, and your stenciled cups are so gorgeous, I thought they were designer paper. Wait...they are...you designed it! 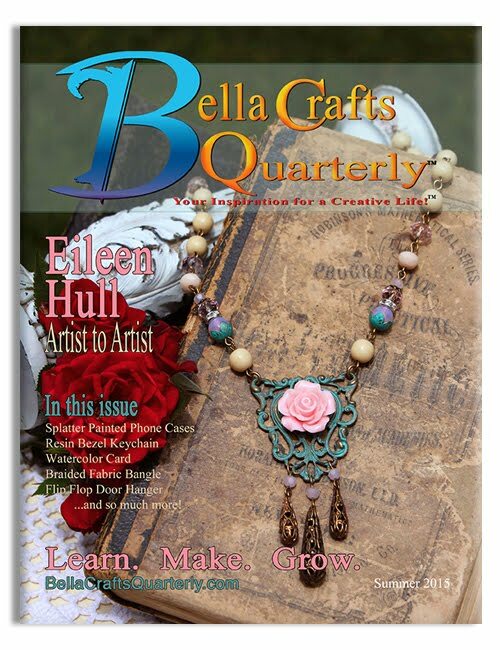 LOL Just wonderful fun, beautiful color and a great idea! 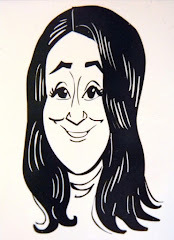 Thanks, Anita! The depth and color on these is amazing! 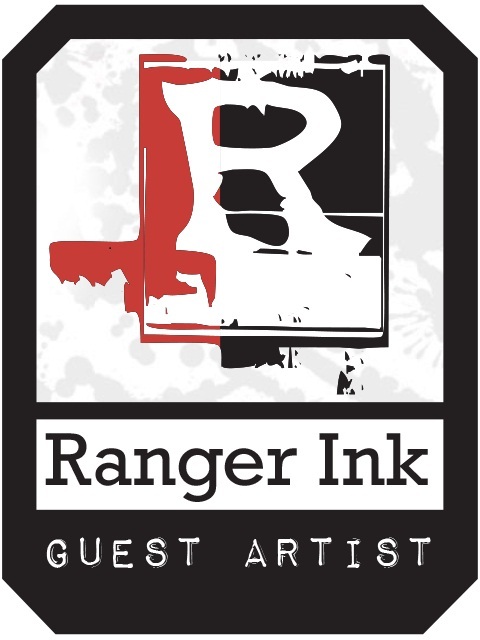 You are such a fabulous artist, thanks for sharing your techniques. What a cute and cozy tags!!! WOWOWOW Your cup tags are amazing, I'm totally flashed, they are breathtaking art works! I keep seeing the coffee cup and I love that but when I saw your tea cups I got all nostalgic and starting drooling. I absolutely LOVE the spoons with sentiments. You rock a project to the moon and back chica. Thanks for making me smile huge time! Beautiful collection of tags Anita! 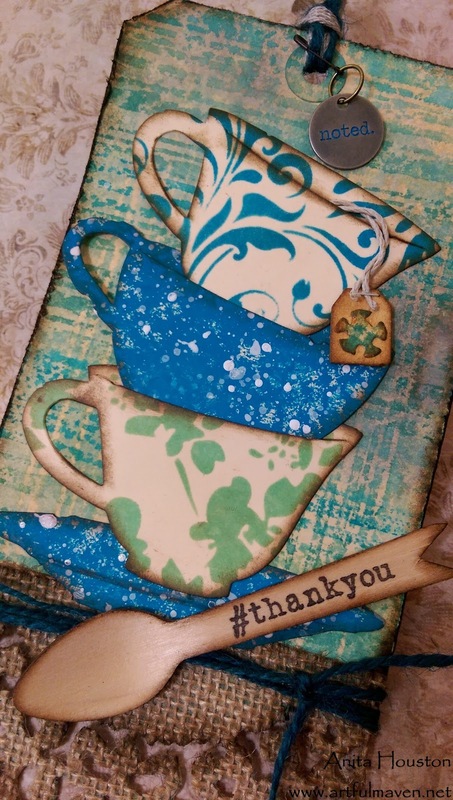 Love all the fun patterned tea cups!